the ONLY Senior resource in Oklahoma for Smart Phones! We are coming to you through our magazine, our radio show and our app! Nobody else connects with the 50-Plus community like we do! Please contact The Oklahoma Senior Journal with any questions, or information on events. Download the OSJ APP for articles, radio shows, map pins, car finder, geo-target specials, and so much more! Download the OSJ APP now to your smart phone OR tablet. 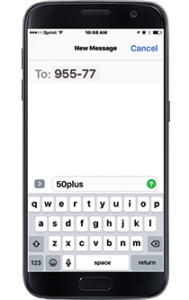 Step 2 – Type the word “50plus” & send! You will receive a link to download our app for important announcements and offers! The app brings valuable information & new technology to our readers and patrons.